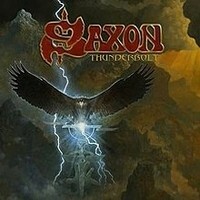 After already ascertaining themselves as one of the powerful surviving NWOBHM acts, the English SAXON still have a lot to say for themselves, a continuous preaching of Heavy Metal thunder. Earlier this year, the band released their 22rd album “Thunderbolt”, which by now generated countless of positive reviews worldwide. My good colleague, Craig Rider, reviewed the album right before its release and granted it a 9/10, which I couldn’t agree more. So you probably ask yourselves, what the hell is this guy reviewing the same album again, and the timing? Come on really. It is not a secret that SAXON have been touring, and will continue right until December, finishing this album support run in Germany. Possibly, in order to commemorate a good release, well received in the charts in Germany (5), Switzerland (6), Scotland (10), Sweden (13), Austria (18), and Czech Republic (29), a new version of the album was issued into work. Along with the original tracklist, three extra crisps were added. It began with a much raw studio version of the vampire themed deathly dance of “Nosferatu”. To be honest I found this version to much convincing in comparison to the dramatic flavor of the orchestration on the original. At least for me, SAXON don’t need no orchestration or added keyboards, especially since they came back playing in the same manner as in the early 80s. Frankfurt surely got massive celebration with the self-titled “Thunderbolt”, a delivery of a good quality live recording with SAXON commanding the scene with a charged up performance. A month later in Los Angeles, a celebration of blood came to be with the demonstration of horrific “Nosferatu”, decimating with an immensely Heavy Metal crushing blow. I am positive that the slow headbanging over this number may had caused neck pains. Served in a high quality digipack, though not similar to their media book reissue cases, crazy fans will enjoy finding out that there is a nice 10 X 10 poster enclosed. A wonderful photo of the band and in the back a close in person photos of the members along with a checklist of details that are the living spirit of a tour, at least a SAXON tour. So you see guys, I never thought of crossing my dear colleague as he did a great work on his review of the album, but I was a must for me to provide a small input on this special release coming at you in a just a few days.